In the Downton Abbey Season 3 Finale it is Lord Robert Grantham, by the end of the episode, who is again leading the way. He is ensuring that tolerance wins the order of the day with his downstairs staff and then upstairs, together with his sons in law Matthew and Tom, he forms a triumvirate at last. He, his valet Bates together with the help of Housekeeper Mrs Hughes and his Butler Carson, are busy proving that whether you dwell upstairs or down you can be bowled over and deemed down and out by some. However if you believe that you can rise again then it will happen best if you are supported by those who care about you. If you don’t want our British correspondent to spoil what happens for you please don’t read on. 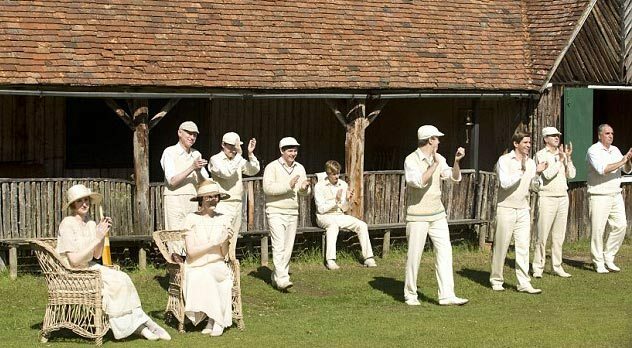 That great English institutional sport Cricket, which also took Australia by storm in the 19th and 20th century, is the main event as the Downton Abbey House team takes on the Downton Village team, promising a bit of light summer relief. In retrospect this series has been a pretty dark affair for much of the journey, but joy oh joy as we come up to Christmas again there is light at the end of the tunnel. Writer Julian Fellowes has planned the odyssey well. The light is definitely dawning on a new day for many of our protagonists, especially now Bates is out of gaol and back on the job working as Lord Robert’s valet. Thomas Barrow, looking downtrodden, is given a few days grace by Carson before leaving the house and the people behind, whom he thought he despised. James has blackmailed Carson into not giving Barrow a reference following ten years of service. What is to become of him? Will things work out alright in the end? The Dowager Countess Violet, whom we now know is always right, is busy meddling in more lives in her indomitable style. She takes on the responsibility for eighteen year old Lady Rose MacClare, whose mother is her niece and godchild. 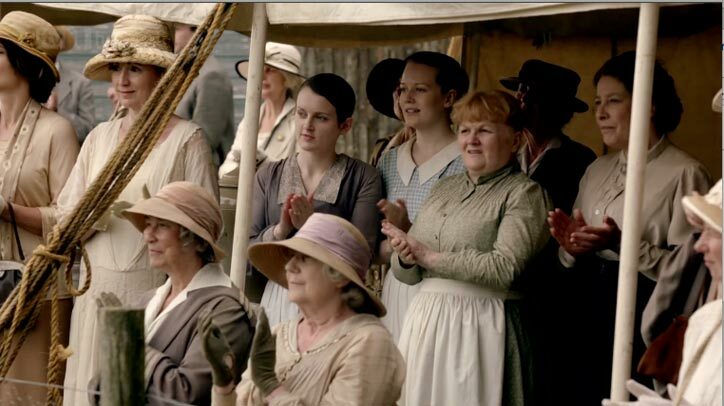 She has asked her, as a special favour, if Rose can come to stay for a while, no doubt hoping the Dowager can help damp down her high spirits. Rose duly arrives, a vision of loveliness in the latest twenties fashion, to take tea with her and Lady Crawley ‘at home’. 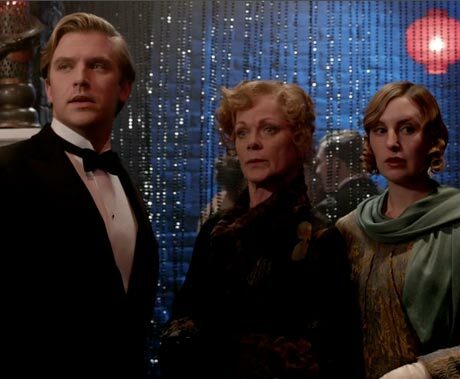 Matthew, Lady Rosamund and Lady Enid in a Jazz Club? She proves to be a handful when she accompanies Edith up to London where they are to stay with the Dowager’s daughter and Lord Robert’s sister Rosamund. Rose gives Edith the slip, but Matthew luckily is also in town staying with them all and he helps as they track her down. Finding her dancing wildly in a jazz club with a married man, it’s Matthew to the rescue. He explains his ‘conditions’ that she has to agree to if he’s to help her out of the mess she finds herself in. After all, Matthew’s always on the ‘side of the downtrodden’. 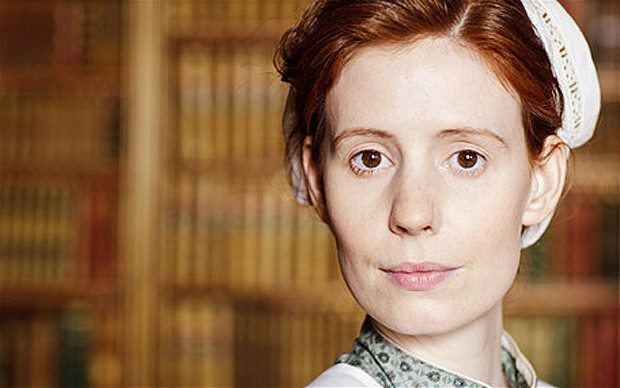 Our unfortunate former housemaid Ethel, who has been working at Lady Crawley’s house in the village and has had such a harrowing time of it all, giving away her dear little boy to that monster father in law and his gentle, lovely wife, is also the target of Dowager Countess Violet’s attention. 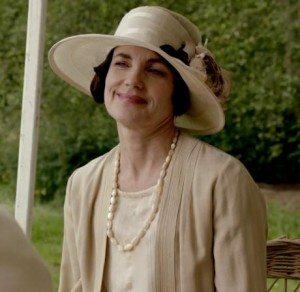 In this episode as Lady Crawley observes the Dowager ‘doesn’t let a matter of convenience stand in the way of a principle’ – as she continues with her mission of finding Ethel another position away from Downton Abbey. The Dowager calls in Ethel’s mother in law to support her stand and enter into cahoots with her and Lady Crawley to help Ethel secure a new job available in a household nearby to the village where her little son lives. This means that he may regularly visit and learn to know his mother as he grows up although he will be led to believe that his mother is his former ‘nanny’. Its a happy result, the one thing they all agree on is that Ethel deserves a second chance at happiness. Also it will help that when she leaves the village the scandal currently being visited on the ‘house’ and its occupants will also lift. Bates and Anna are busy whitewashing the interior of their cute cottage, pinning up curtains and decorating it in true English country house style. Tom Branson is being very supportive and they are helped out of having to put up with it being ‘Trappist simplicity’ style when he mentions the fact they have no furniture to the family over dinner. They offer their support by ordering some old tat brought down from the Downton Abbey attic to help get them by. (Can you just imagine what’s up there!). It’s Bates with all the new and terrible experiences he has had in prison, who comes to Thomas’s rescue as he now knows what it is to feel beaten. Convincing James however to ‘turn a blind eye to sin’ he knows is not going to be easy. James and Alfred are hell bent on bringing Thomas down, after Alfred had caught him trying to kiss James while he was asleep. 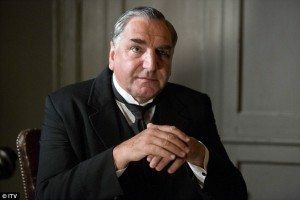 Bates first talks to Mrs Hughes who promises to help and then he confides in Lord Grantham as only he can, about all the hullabaloo going on downstairs over Thomas’s homosexuality and how Carson is all at sea endeavouring to sort it all out. 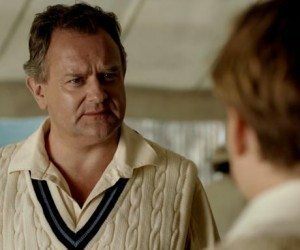 Lord Grantham is entirely sympathetic, after all he observes, they have all known about Thomas’s sexual proclivities for some time. Anyway he comments to Bates ‘if I had cried blue murder every time someone had tried to kiss me at Eton I would have gone hoarse in a month’. So he and Bates decide to ‘meddle’ in affairs and try and sort it all out. It’s not going to be an easy road though. Bates tells him how Miss O’Brien is behind it all, whipping up James and his mood. Lord Robert is not surprised. He and Bates have always worried about her attitude. 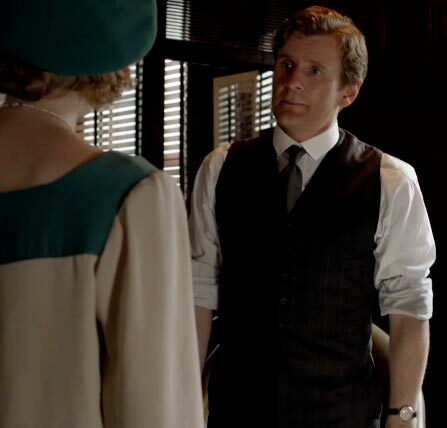 Bates decides he has to learn something about O’Brien so that he can hold over her so that he can convince her to talk to James and make his vindictive behaviour stop. He’s threatening to ‘out’ Thomas if they give him a reference or help him. 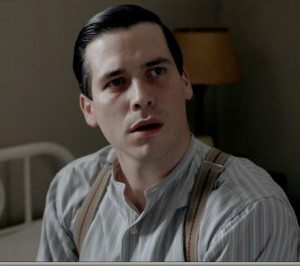 Bates visits Thomas and finding him desolate tells him to “give me the weapon and I will do the work”. He invites Mrs O’Brien to come and have tea with he and Anna at their new home so that he can ‘persuade’ her to undo the damage she has done. While all this is happening Matthew and Tom are trying to talk to Lord Grantham about making the improvements needed to improve the profitability of the estate and secure its future. Matthew while gifted at what he can do, is no wordsmith and he and Lord Robert end up in a shouting match. Branson pleads with him that they are giving the farmers a choice. Lady Cora then accuses him of spending Matthew’s money to keep up the illusion that nothing has changed, when in fact it has and dramatically so. She also points out that his way will only mean them falling once more into a bottomless pit of debt unless he will admit that he is wrong, for once. Lord Robert storms out, determined to keep running interference, despite her pleas. Lady Enid throughout this story is weaving her own web around the Editor of The Sketch in London, for whom she has developed so much regard. She knows he’s flirting with her and values her opinion and what she has to say, but then he stops, always hesitating on taking it any further. So she does some ‘research’ of her own on him. 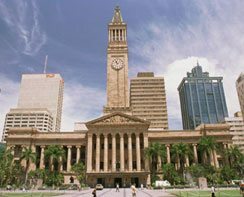 It’s quite remarkable but at this time anyone could ring the newspapers and find out general information about prominent people, including their marital status. She finds out that he is married and confronts him to resign and admonish him for being so bold with an unmarried lady. There is no easy answer, his wife is in an asylum and he has been told will never recover. With the way that society worked in those days, it means he is trapped in that state for the rest of his life as a lunatic cannot be deemed responsible for a marriage breakdown. Enid feels helpless because she has no answers and he pleads for her not to walk away, her working with him has given them both so much joy. Mrs O’Brien is now working flat out to undo all the dreadful work she has done firing up James. 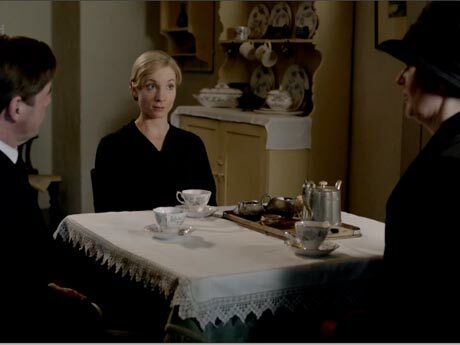 Bates has whispered a phrase in her ear that gets a violent reaction when she comes for tea with he and Anna at their cottage. 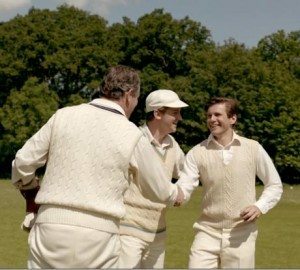 Lord Grantham meanwhile is also endeavouring to coerce Tom Branson into the cricket team as they are one short on the house team. Branson in the end gives in, but only if Lord Robert will work with he and Matthew. Revealing wisdom beyond his years, Branson decides he must take the initiative and talk to Lord Robert at breakfast about him forming a triumvirate with he and Matthew to get the job done. He relays to him how ‘he looks at it’…. ‘every man or woman that marries into this house, every child born into it, has to put their gifts at the families disposal’. I’m a hard worker and I know the land, Matthew knows the law and you understand the responsibilities we owe to the people around here those who work for the estate and those who do not. If we could each do what it is we can do then Downton has a real chance’. Lord Robert compliments Branson, with a new respect for his former chauffer, as an eloquent spokesman for Matthew’s vision. He promises to think about it on one condition that Branson, despite not knowing how to play the game, joins the cricket team. Carson with his always near watchful eye looks very pleased. 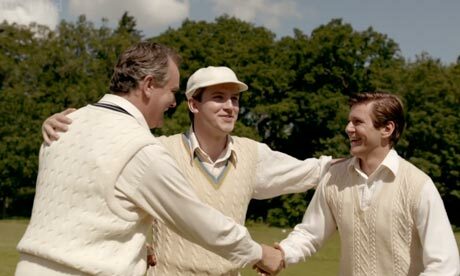 So Matthew begins to teach Tom how to play cricket. 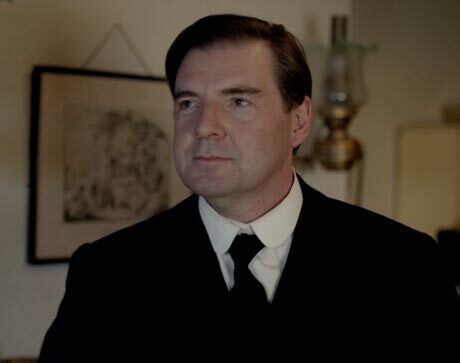 Mrs Hughes, Mr Bates and Anna all turn up to take on Carson and get him to agree to keep Thomas Barrow at Downton as his ‘Under Butler’, which will help him as he ages. Carson is not averse to the idea works out how he can re-juggle all the other positions to suit and they plan to talk to James and make sure it happens. However they have all forgotten about Alfred, who as time progresses is more and more convinced what he witnessed, two men kissing is a sin. As the day of the cricket match dawns tensions are running high. Bates and Anna are sitting in the cricket pavilion when he shares with her that the phrase he whispered to Mrs O’Brien was ‘Her Ladyship’s Soap’. He does not have a clue about what it means, but it is what Thomas has told him. When she really thinks about it Anna will soon realise that she does know what it is all about because we the viewers certainly all do. The cricket match is a good place to talk to everyone, who are all there cheering their teams on, relaxed, and in a good mood. Lord Robert is the one who has been galvanized by Bates and Carson to sort James out. With Carson by his side he thanks James for showing such a ‘largeness of spirit’ in letting Barrow stay on as Under-Butler and then showing ‘brilliance’ congratulates James on becoming ‘first footman’, much to Carson’s and James’s surprise. But is their a fly in the ointment? Two policeman suddenly make an appearance during the break for tea. 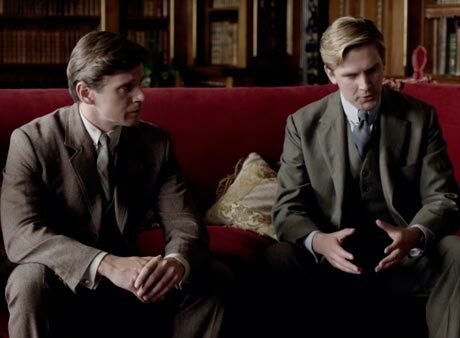 They are wanting to talk to ‘Alfred about ‘Mr Barrow’ but are foiled in the attempt by Lord Grantham and Carson, who keeps them in check while Lord Robert seeks out Alfred to have a word before delivering him up. Alfred is not an easy person to have change his mind but Lord Robert asks the question “Are you without sin Alfred, for I am certainly not”, taking his footman down a peg or two and completely off his high horse. By the time he delivers him up Alfred has changed his mind and Lord Robert explains to the police that his footman simply misinterpreted some ‘rough housing’ amongst the staff. Alfred duly apologizes and the Lord offers his sincere apologies to the police and dismissively offers them some tea. 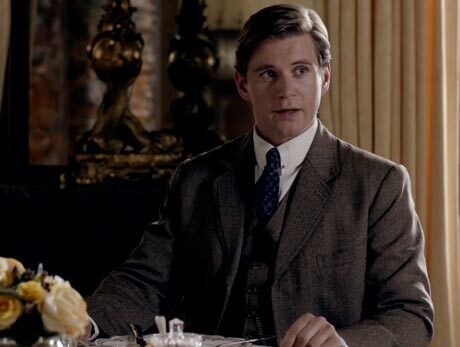 Tom sits in the tent at tea with Lady Cora and tells her of his decision to stay at Downton Abbey while baby Sybil is in her formative years, to give her and himself all the support they need. Matthew although saving Rose from the madness of her Jazz moment is unable to help her any further. The Dowager has overheard a conversation between Rose and Enid about the ‘jazz incident’, and tricks the truth out of her daughter Rosamund and Rose is all upset, having being banished by her family to Scotland with an ageing aunt until Christmas. A punishment worse than death by a ‘thousand cuts’ for an eighteen year old. During tea Matthew and Mary are also reflecting on ‘how they will be building a new Kingdom while making a little prince’. So happy times are ahead. Mary is so obviously ‘clucky’ as she cradles Sybil and Tom’s baby in her arms, much to the admiration of Tom and Matthew both. They all resume the match after tea and Tom becomes the hero, catching the final ball of the match so that the ‘house’ side wins for the first time in years, a sign of things to come. It’s all so perfect. Our correspondent and the Culture Concept Circle team would like to have the last word on the subject. We predict that a 2012 Downton Abbey Xmas Event special will be most likely to be a Matthew and Mary first baby event. Well you have to admit it would also make the perfect ‘happening’ and at the perfect time of year, so joyful and filled with glad tidings.